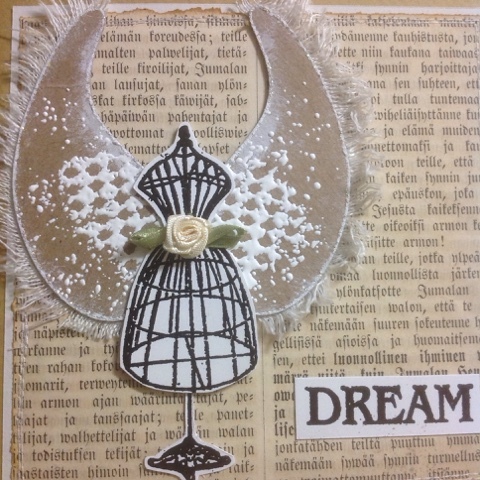 Posting for the WOW embossing powders challenge (anything goes, links placed in comments), the Ribbon Girl January challenge (Any Image), the Craft Stamper January challenge (Take a Stamp) and the Rubber Dance challenge (black and white + chosen third colour = kraft). I started by realizing I could cut a narrow strip from the frayed edge of some linen fabric and use it on the Totem wings from Eye Connect Crafts. 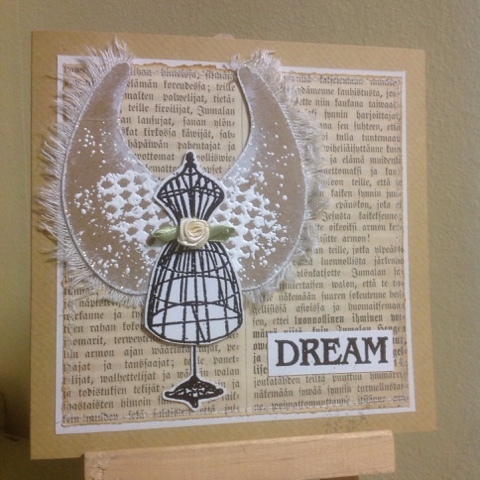 I stamped the harlequin stamp with Versamark and heat embossed with chunky white embossing powder for a distressed and chunky look. I added sprinkles of the embossing powder too. The edges got some white acrylic paint and some glitter, the linen was fastened on the back with doublesided tape. The mannequin was stamped twice and heat embossed with black. A whole image was fastened on the card base, the wings on top of it and the dress part was attached on top and finished with a fabric rose. I have a broken old book from about 1850 from which I have used pages for all sorts of things. They fit my colour choice of kraft/tan, so I mounted a sheet on the card base using white paper to give a border and sewed around the piece. The craft of these card bases is a mustard yellow hue, which I don't really like, so I prefer to cover it up when possible. This is really pretty, Kristiina! Love the chipboard wings tucked behind my mannequin stamp. So beautiful with the white embossing. Thank you! Love it! It's so beautiful! Hugs Susanne.